In this episode, Theresa, Spike and Jessica catch up from the summer break. They each discussed how July goes so quickly and provides a much needed down time from the business of the school year. Now, as they are quickly realizing, is the time to make sure all of the Back to School lists are completed such as scheduling, organization of the school and the most important part... the first few days of the school year. Thank you for listening! 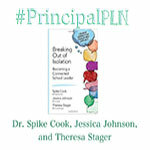 Connect with us on Twitter @principalpln or #principalpln on Twitter or Instagram.